It makes the news when a city like Helsinki announces that, by 2025, its suite of mobility-on-demand solutions will be so comprehensive that it will be quite pointless to own a car. But in fact, the trend in many large cities has been going that way for a long time. Compare these two pictures of Oxford Street, London's shopping paradise, the first taken in the up-beat 1950s, the second this summer. In the days just after the War, Oxford Street was already lined with shops. There was enough space for three cars abreast in each direction. The sidewalk was fairly generous. 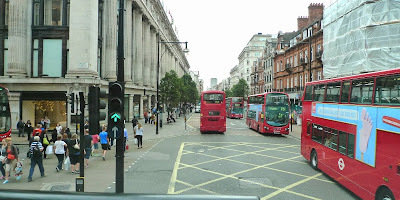 Private automobiles shared the road with the famed double-decker buses, and the iconic London taxis, all black. These days, the imposing façade of Selfridges still dominates the streetscape around Bond Street. Double-decker buses still ply the road: lots and lots of them. In fact, during most of the day buses make up most of the traffic. Three lanes accomodate traffic in both directions, with bus stops carved out of the sidewalk at intervals. Away from the bus stops, the sidewalks occupy well over half the area of the street. They are wide enough for the planting of young trees which promise to grow to majestic size in time. A bewildering number of buses serve Oxford Street, adroitly steered by their drivers (more traffic artists than mere drivers) to within a small number of inches of other objects both moving and stationary. If that's too slow for you, you can use one of four Underground stops to get access to the faster trains. An Oyster card gives quick access to both. After buses, the most common vehicles on central London's streets are cabs, no longer all black but plastered over with advertising, some very funny, some not. But between the congestion charge, the congestion itself, and the nightmare of having to find parking, there are now far fewer cars than there used to be. Why own a car, if you can have easy mobility without one? And this is not the end. There are calls to restrict the road surface available to vehicle traffic even further. For a modern city, London still has a laughable number of bicycle paths (nearly none). A new Underground line is under construction: Crossrail, connecting Heathrow to the heart of London including the City, ready for the first passengers in 2018. I could devote a whole other post on the engineering prowess required to thread a new tube line through London's invisible maze of water mains,optic fiber pathways, other subway tunnels, sewers dating back hundreds of years: literally, the infra-structure: the structure that is below the city. Wow. And why not make the whole responsive to demand? The technology is here already, used in real-time ridesharing. Implementing that technology for city-wide on-demand mobility requires engineering prowess of a different kind, but computers already deal with massive routing problems in real time, getting the morsel of data you want from the server to your screen at the click of a mouse, and almost instantly. Compared to managing internet traffic, city traffic is a walk in the park. So to speak. For those who cannot, or choose not to, use the smartphones that would make this kind of mobility very easy: there is still the old-fashioned phone. Even - dare I say it? - the landline. The elderly and handicapped in the Netherlands already use such a service, called RegioTaxi: this is an on-demand door-to-door bus service with nearly the same fare as city buses. Of course you can make an online reservation (up to an hour ahead) but you can also call in and talk to a live person. If you get on with your membership card, the fare is charged directly to your linked bank account. Ditch the car: the car payments, the search for parking, the repairs, the annual inspection, shoveling snow from the driveway. While retaining the mobility. I could totally live like that. You are not the only one in that situation! But smaller towns have their advantages, and need their own suite of solutions. To start with, bike paths are great, since most of our trips are local anyway. A well-laid local bus route, connecting to more long-distance travel options, can get you a long way. And you can implement a local on-demand jitney of ride-share service: an enterprise opportunity in every town! The problem is that we in America have grown up to believe that the automobile is a necessity. I haven't owned a car in three years and rarely do I miss having one. Cars create such an economy (tires, gas, insurance, maintenance, etc.) that the American people are imbedded into the thought that there is something wrong with you if you do not own one. I was no happier when I owned one than I am now. I ride my bicycle or take public transportation. I can also live a decent lifestyle on a meager wage because automotive maintenance expenses are no longer there. It's fantastic that you are car-free! I agree, it saves a bundle. I live in a small town and find I still need a car, but between the bike, the rideshares and some trip planning I'm at 8000 miles a year, half the US average. I agree it's terrible that without a car - or even a driver's license - you're considered a second class citizen. They ask for your driver's license when you vote (! ), when you buy a beer, even for going swimming at the town pool.